Dealers will lock down floor mats to keep them away from the gas pedal. DETROIT -- Toyota Motor Corp. is recalling 2.17 million Toyota and Lexus vehicles in the United States to inspect and repair accelerator pedals that may get trapped in floor mats or carpeting. The automaker said more than half of the recalled vehicles -- 1.54 million models -- are being added to a giant 2009 recall to inspect and repair accelerator pedals that may become trapped in floor mats. A 10-month investigation by NASA engineers determined that electronic flaws were not to blame for widespread consumer complaints of unintended acceleration in Toyota and Lexus models, the U.S. Department of Transportation said this month. The Japanese automaker has now recalled 19.2 million Toyota and Lexus vehicles worldwide and more than 13.7 million in the United States to address safety problems since the fall of 2009. The latest recalls -- announced exactly a year after Toyota President Akio Toyoda testified before Congress -- also address government concerns over whether the automaker recalled enough vehicles following reports of unintended acceleration. Federal safety officials have imposed fines of nearly $49 million on the automaker for failing to undertake three separate recalls in a timely manner. NHTSA said it doesn't plan to impose any more fines following the latest recalls. The Transportation Department said it had reviewed more than 400,000 pages of Toyota documents to determine whether the scope of the automaker's recalls for pedal entrapment was sufficient. "As a result of the agency's review, (the National Highway Traffic Safety Administration) asked Toyota to recall these additional vehicles, and now that the company has done so, our investigation is closed," NHTSA administrator David Strickland said in a statement today. Toyota said 20,000 2006 and early 2007 Lexus GS 300 and GS 350 all-wheel-drive sedans will be recalled to modify the shape of the plastic pad embedded in the driver's side floor carpet. If the floor carpet around the accelerator pedal is not properly replaced after service, Toyota said there is a possibility that the plastic pad embedded into the floor carpet may interfere with operation of the accelerator pedal. Toyota said it had received two complaints about the issue. Owners of the GS 300 and GS 350 vehicles will be notified in early March, Toyota said. The automaker also is recalling 372,000 2004 through 2006 and early 2007 Lexus RX 330, RX 350, and RX 400h units, and about 397,000 Toyota Highlander and Highlander HV vehicles sold from the 2004 through 2006 model years to replace the driver's side floor carpet cover and its two retention clips. Toyota said if the forward retention clip used to secure the floor carpet cover -- located in front of the center console -- is not installed properly, the cover may lean toward the accelerator pedal and interfere with operation of the accelerator pedal arm. RX and Highlander owners will be notified by mail how to inspect the pedal arm or how to contact a dealer to perform the inspection. Toyota said owners will receive a second notice by mail once the replacement covers are available. Toyota -- addressing government concerns -- expanded a massive recall announced in November 2009 to address possible floor mat entrapment of the accelerator pedal. The affected 1.5 million vehicles include about 603,000 Toyota 4Runner SUVs sold from the 2003 through 2009 model years; about 17,000 Lexus LX 570 SUVS sold from the 2008 through 2011 models years; and about 761,000 Toyota RAV4 vehicles sold from the 2006 through 2010 model years. Toyota said owners of the 4Runner, LX 570, and RAV4 vehicles will be notified soon, and receive a second notice once recall plans are complete. Toyota and Lexus dealers will perform the recalls at no charge, Toyota said. Toyota spokesman Brian Lyons said today the company had received complaints that prompted the latest recalls, but that the automaker was unaware of any accidents or injuries related to the new recalls. Toyota’s U.S. sales and reputation have suffered as a result of the recalls, and the automaker has responded by launching a major advertising campaign to reassure consumers about the quality and reliability of its cars and light trucks. TORRANCE, Calif., [February 24], 2011 -- Toyota Motor Sales (TMS), U.S.A., Inc., today announced that it will conduct a voluntary safety recall of approximately 20,000 2006 and early 2007 Model Year GS 300 and GS 350 All-Wheel Drive vehicles to modify the shape of the plastic pad embedded in the driver's side floor carpet. In the event that the floor carpet around the accelerator pedal is not properly replaced in the correct position after a service operation, there is a possibility that the plastic pad embedded into the floor carpet may interfere with the operation of the accelerator pedal. If this occurs, the accelerator pedal may become temporarily stuck in a partially depressed position rather than returning to the idle position. Owners of the involved GS 300 and GS 350 All-Wheel Drive vehicles will receive a notification by first class mail beginning in early March 2011. Toyota will also voluntarily recall approximately 372,000 2004 through 2006 and early 2007 RX 330, RX 350, and RX 400h vehicles, and approximately 397,000 2004 through 2006 Highlander and Highlander HV vehicles to replace the driver's side floor carpet cover and its two retention clips. 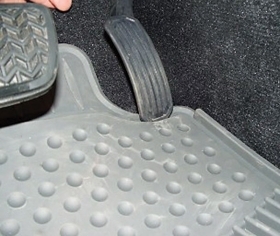 If the forward retention clip used to secure the floor carpet cover, which is located in front of the center console, is not installed properly, the cover may lean toward the accelerator pedal and interfere with the accelerator pedal arm. If this occurs, the accelerator pedal may become temporarily stuck in a partially depressed position rather than returning to the idle position. Owners of the involved RX and Highlander vehicles will receive an interim notification by first class mail beginning in the near future, explaining how to inspect for this condition or that they may contact their local dealer to perform the inspection. Owners will receive a second notification once the replacement covers are available. Owners of the involved 4Runner, LX 570, and RAV4 vehicles will receive an interim notification by first class mail beginning in the near future, informing them of the condition. Owners will receive a second notification once the recall preparations are complete. Toyota and Lexus dealers will implement the newly announced and amended recall remedies at no charge to the vehicle owners.